If you have any questions, comments, suggestions for additional garden markers or a special sign design request, feel free to email us at sales@northwoodslaser.net or call 262-251-1722. You can also fill out our online form, and we will get back to you as soon as possible. Our naturalist had always been looking for the “perfect” educational garden sign. Tired of laminating signs that faded in sunlight, ran with the snow cover or painting rocks that chipped, she worked with Northwoods Laser and Embroidery to design these weather proof signs. Knowing they would last, she took the opportunity to design markers with educational information she knew kids and teachers would benefit from: pictures of the plant, standards of learning vocabulary, plant identification characteristics, interesting facts, and the lore and uses of plants. The best news: These signs contain more information than the usual botanical sign, have a beautiful laser engraved plant image and cost less than other signs you can find on the internet. The signs measure 4 inches by 5 inches and are mounted on a sturdy galvanized steel stake—no more plastic breakage! 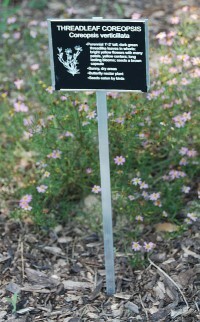 Whether you are at a school, a botanical garden or demonstration garden, these markers will reach out to your public audience and interest them in your plants. Smart Garden Signs © All rights reserved.